• To awaken and to orient the Individuals and executives to a new world of opportunities of Today’s World. Renewing the mindset of the Individual to fit the times we live in. Facilitate Paradigm Shift, empower and inform for personal growth for economic development. • Explore the employment opportunities Globally and domestically without having to move from the community or commute. • How the community members can become self employed and build a business from the corner of one’s home with global reach and no previous experience. • How to raise the belief level of the members of the community to prepare to accept the change in the world of business and employment. • How to set Visions and Goals with this new self empowered personality with the opportunities available in Today’s World. • Success systems for Today’s World for developing personal growth to balance business and personal life and developing A One Person Learning Organization. 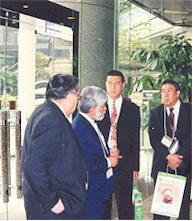 Councilor and Economic Development Officer of Cree Nation of Waskaganish, Jack Diamond, establishing Hong Kong Waskaganish Development Corporation in Hong Kong. 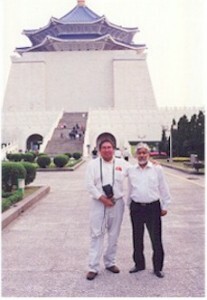 Seen here with Andy Chan of Tulshi Sen Consulting in Hong Kong. 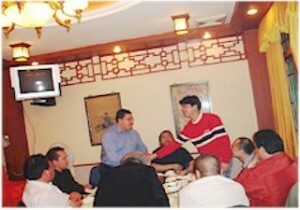 Chief Robert Kitchen seen here shaking hands with the President of the Timber Company in Guangdong, China after the deal was made at a traditional Chinese Banquet hosted by Tulshi Sen Consulting in Guangdong, China. Changes are taking place at lightening speed. The world seems to be different every morning when we wake up. This is no exaggeration. The playing fields of the world have been leveled. The big companies are trying to act small to get the markets and the small companies are acting big to get credibility. This world that we live in is one economic system and one eco system. We live in a seamless world. Our community and our Nation is just like a neighborhood in the global community. When we phone the lost luggage number for American Airlines we may get a person in India helping us find our luggage. When we phone Dell to repair our computer a person in India fixes it for us over the phone with a semi American and Indian Accent. In light of these lightening changes the whole economic and social approach for developing individuals and businesses needs a whole new wisdom and understanding. Doctors in India are writing the report on a MRI Scan made in Calgary while the Doctors in Calgary who made the scan sleep in Canada. This has opened up opportunities globally as geographical location is no longer an obstacle to participate in the Global Economy. Isolation and remote communities is no longer an obstacle for developing a one person global enterprise. Mr. Sen, prior to meeting the Hong Kong Trade Development Council in Hong Kong, briefing the First Nation Delegation from Canada on the ins and outs of doing business in Hong Kong. Gutenberg’s invention of the printing press changed the world. Newspapers and magazines and books created mass communications and information exchange. The Internet and the Web has changed the way we do business, communicate, date, romance, travel and live. It has made it possible to make children into millionaires and youths into billionaires with nothing else but an idea and a dream. Today one can sell a product to a person across the world or across the street with no added cost or travel requirement. Agricultural age brought in the Industrial age then the age of knowledge came and now we live in an age of concept. Production and knowledge is outsourced to India and China. An idea can be conceived by a youth in a small remote community, sent out to India or China and developed into a product. This product can then be marketed round the world from that small isolated community or from anywhere in the world. In Today’s World the individual is not limited by his pocket book as much as he is limited by his imagination. To stimulate the imagination of the individual and to build capacity is one of the primary goals of this Initiative. Whether the individual is living in the Canadian Rockies or in Toronto makes no difference. They have equal access to the opportunities of the world at their fingertips regardless of their locations. The major requirement is a powerful imagination. Education is not a learning process anymore. It is more of a finding process and then having self esteem and self empowerment for applying this information for personal development. Almost everything which is available in an educational curriculum is also available on the Web. And more than that, for no charge. The application of today’s education is being empowered to use this information that is freely available. This program is exactly that. One of the objectives of the program is to open up the minds and empower the hearts of the participants to process thought, in harmony with today’s world and become successful. Today anyone can get employment in any place they desire in town or across the Earth and be gainfully employed without having to commute. They can work from their homes for a school in China or a school in town locally. They can live locally and work globally. To know how to embrace these opportunities for the community members is one of the outcomes of this program, Building the Future™, the world of new businesses and new markets and new careers. We live in a collaborative world and no single person alone can build a business all by him/herself. The collaborators are all over the globe, ready and willing to collaborate without discrimination between rich and poor or big and small organizations. For example the Web hosting company can be in the UK, the web designer in India or Rumania. The supply can come from China and the delivery of the product can be done with the click of a button anywhere in the world. The entrepreneur who is running the business may be located in the Canadian Rockies or in New York City. It makes no difference. All of these services and collaborators are available to a Fortune 500 Company or to an individual who is starting his business with limited finances and with the same ease and also hassle free. This Initiative’s major emphasis is to prepare the mindset and build capacity of the participants to recognize and seize these opportunities that are universally available for the community members. Empower the candidates to lead change and also lead their communities in Today’s world of promise and prosperity. How to develop capacity to build businesses and/or careers. "I just attended a wonderful seminar hosted by Economic Development. This seminar was on Entrepreneurial Development and the facilitator was Tulshi Sen. What he revealed at this seminar is just the type of skill we as small businesses need to put us over the top. I have been a business owner for the past twelve years and know the frustrations of running a business. Tulshi Sen is a dedicated person who has seen the need and potential of organizing Entrepreneurs on this Reserve. Thanks to his seminar I will have the tools and benefits I will need to expand my business.....Those who attended received countless avenues to explore and consider. I know that with the knowledge gained at this seminar the reserve and small business will become big business." "I have just attended a seminar on Entrepreneurial skills and setup. I must commend the people responsible for setting up this seminar as they brought in an experienced individual in this field. Tulshi Sen is a great teacher and knows how to operate a business. He is sharing the results of his experiences and is determined to see us succeed. With his help how can we fail? You as leaders must realize that our people need to expand our horizons and become self sufficient. I learned that not only can self sufficiency be achieved, much needed jobs will be created. Look at how many are on social assistance, think of how many will gain employment. There are many other benefits including an economic base which can rival communities off the reserve. Our children and grandchildren would benefit the most. I am excited about this venture and am looking forward to implementing the knowledge I have gained." I strongly believe that if we continue with the seminars, we would in time, be able to teach our own people how to get a business started and we would be able to use our own experiences as examples. Tulshi Sen has opened up my mind and heart to many idea's and now that I have a vision of how successful I can be, I also have the tools to market my dream, which will some day be my reality. This dream is attributed to Tulshi Sen, I feel like the sky is the limit and that there are no boundaries and everything is within my grasp. I know many people who have had great ideas but just didn't know how to execute them, they didn't know what channels to go through and just ended up doing nothing. Tulshi Sen has taught us how to market our ideas and this is something he has made so simple to understand and to execute that anyone can do it, even me. There are so many opportunities out there that I was unaware of; after a few short days at Tulshi Sen Seminars, he has opened our minds and our hearts to many great ideas. I strongly believe that he is a great benefit to the people who have attended his sessions."